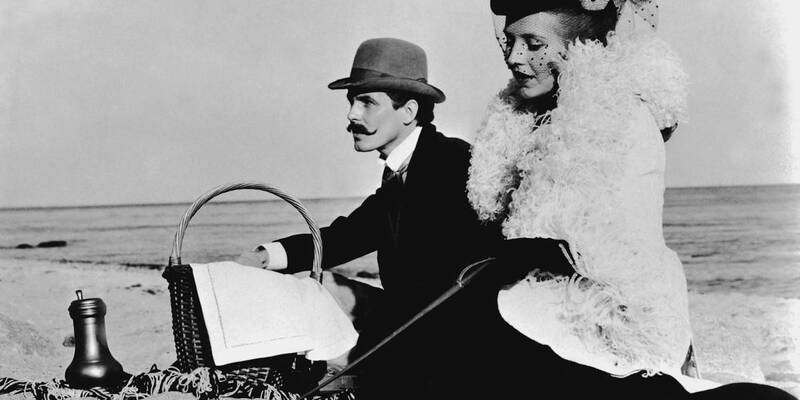 Effi Briest, arguably Rainer Werner Fassbinder’s most acclaimed film, is an entrancing string of black and white vignettes portraying isolation, repressed passion, faltering self-awareness and depression during Germany’s Bismarck era. Based on the 19th-century German realist novel by Theodor Fontane, Effi Briest follows the short, tragic rise and fall of young German aristocrat Effi Briest (Hanna Schygulla) as she’s betrothed to Baron Geert von Innstetten (Wolfgang Schenck), a highly influential civil servant and noble rising star who is twice Effi’s senior. While warm and welcoming to his new wife, von Innstetten, who’s a relentless careerist, must frequently leave Effi alone in the unfamiliar provincial town of Kessin where Effi begins to fear their home may be haunted. In voicing her fears, however, Effi is met with harshness by her husband who is gradually losing patience with her. Despite the Baron’s initial efforts, it is blatantly clear there is an unspoken distance developing in these two newlyweds’ lives and that things are increasingly becoming amiss. Traduced by high society for her presumed inexperience, isolated and emotionally tormented, Effi soon finds herself in the arms of the young, charming Major von Crampas (Ulli Lommel) who, in von Innstetten’s eyes, is a man he maintains friendly relations with yet regards as an incessant womanizer Effi should be cautious of. This warning from her husband reaches Effi a little too late – talk about frienemies! Do not let the dreamy nature of this film’s vignettes fool you. This lavish yet fiercely intimate glimpse into the life of Effi will leave you feeling as haunted as her home. Schygulla’s portrayal of Effi as a playful, naïve teenager with a wild spirit and taste for wonderment is organic and potent — to a point that enables viewers to witness the stark contrast that ultimately moves Effi’s peers to view her as a tragic, misaligned ‘young creature’ in tense, unforgiving times rife with falsity and martial dominance. Even as we see Effi face her descent into dire regret and longing, the inner-workings of this saddened young noblewoman is still something that’s left to be secretly desired by even her staunchest (and envious) of peers. While the fate of Effi is disproportionately unfortunate, her offbeat spirit is the very core of this unique and dark narrative. As part of TIFF Cinematheque’s Imitations of Life: The Films of Rainer Werner Fassbinder, running from October 28th to December 23rd, Effi Briest screens at 6:45pm on Thursday, November 3rd.